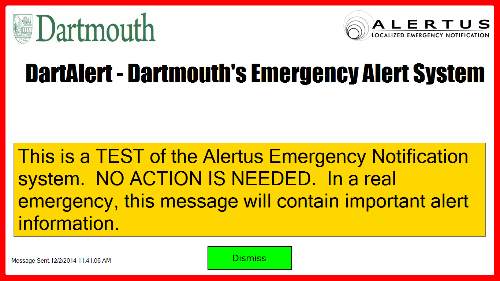 DartAlert Desktop software by Alertus allows Dartmouth to provide critical emergency alert notifications to you. When the system is activated by Safety and Security, the screen will flash with an emergency notification until the user acknowledges the alert. The DartAlert Desktop application is part of the campus DartAlert system. Our goal in emergency management is to provide you with as many different alerting modes as possible so that we are more likely to reach you in an emergency. DartAlert Desktop is launched at the same time as other DartAlerts, anytime there is an emergency where we need to provide a timely alert to inform our community of an impending danger. It could be used for micro-burst storms, tornados, hostile intruders, etc. Why do I need it when I already get email, phone calls, and/or text messages? DartAlert Desktop is now Dartmouth's fastest alerting technology taking less than 5 seconds to reach all computers. Moreover it adds an additional layer of redundancy to our system. Dartmouth's goal in emergency alerting is to reach as many people as possible. We can't control everything; sometimes systems fail, cell phones don't have service everywhere, etc. When information is critical, we want to reach you in as many ways as possible. During an emergency situation, the screen will flash with an emergency message until the user acknowledges the message or the message times out as shown below. The alert is launched when Safety and Security activate the DartAlert system. If you are on campus and your computer is on and connected to the Dartmouth network, you will receive the alert. It does not work if you are off the Dartmouth network. What do I have to do when it's launched? When an alert is launched DartAlert Desktop will pop up and flash on your screen to get your attention. When you have read the alert, click the dismiss button. My DartAlert Alertus icon is red? Why? DartAlert by Alertus only works when you are connected to the Dartmouth Network. When you are on the Dartmouth network, the Alertus icon will be yellow indicating it is operating correctly. If you are traveling off-campus and not using the VPN, the icon will be red. 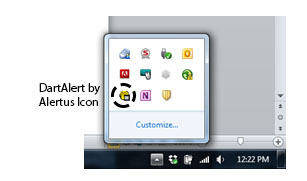 The image below shows the DartAlert by Alertus icon. Does the DartAlert application use my personal information? No, the DartAlert Alertus application looks for alerts from DartAlert and launches if triggered. No personal information is sent to the server. The application has been vetted by Dartmouth's Network Services. If you have a Dartmouth Standards Managed PC, you should already have the software. Look for the yellow circle icon in your system tray as shown above. If you do not have a PC Standards machine click here Download DartAlert Desktop and follow the installation instructions for Windows or Mac computers.